A plant makes a wonderful gift, and many will last for years, and may produce more plants if given proper care. Below are a few helpful tips to care for some of the more popular plants and some general tips. A small plant which may bloom at anytime. These beauties will grow well under flourescent light, and like bright, indirect sunlight. Cut off the flowers after the bloom dies and provide good ventilation. Don't overwater, and keep the soil evenly moist at all times. Feed monthly during the spring through the fall with a nitrogen-free fertilizer. Great indoor plants that thrive in bright indirect sunlight, and may be placed outdoors for the summer in an area of filtered light. Ensure that the plant has good drainage and keep it away from drafts. Never let the plant sit in water. Mist the fronds occasionally with warm water and feed monthly. These plants produce beautiful blooms February through May. They require specific care, such as good rich potting soil and full sunlight. Azaleas should be fed every two weeks during the growing season. Remove all dead flowers and keep the soil on the wet side. The ideal hanging basket plant. It requires a little extra care in that it likes good, rich potting soil and should be misted frequently with warm water. Boston ferns grow well in bright indirect sunlight. Keep the soil barely moist and feed weekly. Beautiful, exotic plants requiring some extra care and attention. Bromeliads grow best indoors in bright indirect sunlight. Use good rich potting soil, keep the soil evenly moist and feed about every eight months. Bromeliads bloom April through June. These plants require full sunlight and should be pinched back occasionally for good shape. Croton plants are poisonous and should not be kept around children. Keep the soil barely moist and feed every two weeks when young. Fertilize weekly after maturity. Cyclamen have beautiful dark green foliage with unique "upside down" blooms that flower December through May. They are dormant for the summer and should be repotted in late summer and kept cool. Stop watering in late spring and resume watering in late summer. Feed every two weeks while in growth. Bright indirect sunlight and evenly moist soil is best. Cyclamen are poisonous and should not be kept around children. 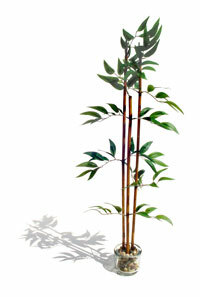 E asy care plants with large leaves, making it an effective remover of indoor air pollutants. Diffenbachias are poisonous if ingested. Do not keep around children. Place this plant in bright indirect sunlight and let its soil become moderately dry between waterings. Easy to grow indoors in bright indirect sunlight. Good general purpose potting soil is fine and should be kept evenly moist. Leaf tips may turn brown if the plant is under-watered. Feed every two weeks. A wonderfully fragrant blooming plant, but they generally require a little extra care and attention. Gardenias grow best inside the house with bright indirect sunlight. The plant requires good rich potting soil, kept evenly moist at all times. Mist the plant frequently with warm water, feed every two weeks and prune in early spring. Gardenias flower June through August. Another plant that produces beautiful blooms July through September and are very easy to grow. They prefer full sunlight. Be careful the crown of the plant is above the soil and provide good drainage. Allow the soil to become moderately dry between waterings and feed every two weeks during growth periods. G orgeous blooming shrubs with showy color June through December. They require full sunlight and good, rich potting soil kept evenly moist. Prune the plant way back in early spring and feed every two weeks during growth with fertilizer suitable for acid loving plants. Easy care leafy green plants perfect for hanging baskets. Ivy grows well in bright indirect sunlight. Keep the soil evenly moist, mist occasionally with warm water and feed every two weeks during growth periods. These plants are succulents and bloom January through July. Kalanchoe grow best indoors in full sunlight. Use good general purpose potting soil with a little added sand. Avoid getting water on the leaves, be careful not to over-water and feed only twice a year, once in April and once in July. These pines require a little extra care and attention. Bright indirect sunlight is best and over-watering must be avoided. Turn the plant occasionally to keep it symmetrical. If possible put the pine outside during the summer in bright light. Feed every two weeks and do not fertilize in the winter. Exquisite blooming plants, requiring just a little extra care. Orchids grow well in bright indirect sunlight and may produce flowers at anytime. Avoid cold drafts. Most orchids have sphagnum moss potting mix and should be kept evenly moist. Be careful not to over-water. Feed every two weeks during the spring and summer with orchid fertilizer. Peace lilies are large-leafed plants, which produce white blooms April through October. They require full sunlight and should be placed away from drafts. When watering, drench the soil and allow it to become moderately dry between waterings. Feed every two weeks during the summer months only. E asy care plants, which grow best indoors in bright indirect sunlight. This plant is a climber if given proper support. Philodendrons are poisonous if ingested. Do not keep around children. Keep this plant's soil barely moist and feed it every two weeks when in growth. A climbing green plant, pothos do well indoors in bright indirect sunlight, but will grow in rooms with less light as well. Keep this plant's soil evenly moist and supply good drainage. Pothos is a good climber, if given proper support. Otherwise, pinch back to maintain its shape. Fertilize every two weeks. Easy care leafy green plants. They grow well indoors in full sunlight. When watering, drench the soil and allow it to become moderately dry between waterings. Feed monthly spring through summer. Lige Green Flowers & Gifts... delivering fresh flowers daily to Arlington, TX and the surrounding areas including Fort Worth, Grand Prairie, Kennedale, Mansfield, American Airlines Center, and Hurst-Euless-Bedford. Lige Green Flowers & Gifts features a large inventory of fresh flowers, Tropical flowers, Plants, European/dish gardens, contemporary and traditional arrangements, high-style floral arrangements, funeral flowers, an extensive gift line, gourmet and fruit baskets, gift baskets, and candles. As a leading florist in Arlington and the Fort Worth area, Lige Green Flowers & Gifts provides quality flowers, arrangements, and gifts for all special occasions. From birthday flowers to sympathy flowers to get well flowers - all available for residence, hospital, and funeral home delivery - you can trust your Arlington area flower shop to have just the right arrangement for you. Browse the Lige Green Flowers & Gifts website and order online, or call our flower shop in Arlington and speak with one of our flower and gift experts today!